This panel is similar to the project modification panel. - On the top left-hand side of the import panel you will find all information relative to the file selected in the requester window (size, frame rate, aspect ratio, etc.). - These are followed by a text field which indicates the path and name of the file you have chosen. - The Browse button allows you, in case of error, to choose another file in the requester window. - The Preload button will be discussed in the Dependencies section of this lesson. Your video file may be modified when imported to suit your needs: project name, width, height, frame rate, aspect ratio, field, rotation may all be modified as we discovered in the previous section. The Alpha popup menu, however, possesses specific options including: Guess, Premultiply, No Premultiply, Without alpha and Alpha only. * The option Guess will consider that the Alpha value is equal to the maximum RGBA values present in the sequence. * The option Premultiply refers to the method of calculating each pixel. In this case, each pixel is multiplied by its alpha value which results in the fact that these pixels are calculated quicker than with the No Premultiply option. * The option No alpha will load your sequence without transparency if it had any beforehand. * Finally, the option Alpha only will only load a mask of the sequence. This mask will be extracted from the alpha layer of the sequence. Further down, three tabs allow you to choose the form to be given to your imported video: the imported video may be created either as a new project, a new layer in the current project or as a custom brush (these three options are mutually exclusive). - The video sample loaded will be that located between the two time markers on the right side of the panel. You may also choose to include sound with your video by checking the Import audio box in the import footage panel. 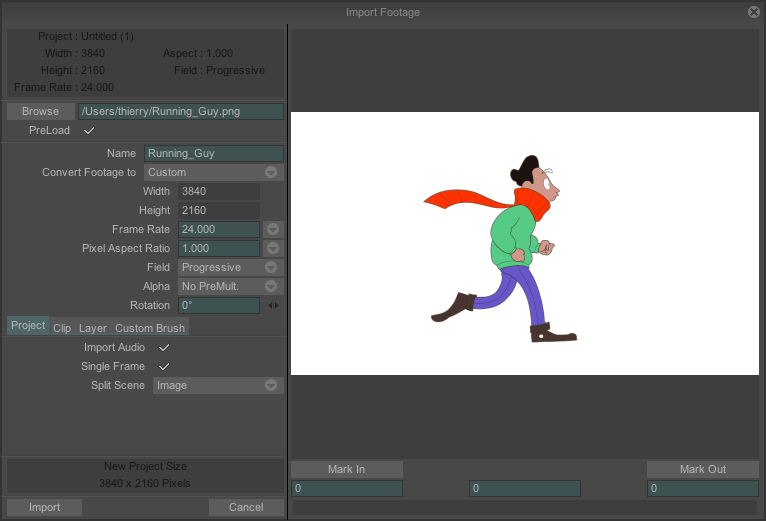 - The single frame check box, if checked, will create a project with a layer and a single frame: the frame selected in the right side of the panel. - Create a layer with a single frame (here again, a single frame or large sample may be imported between the mark in and mark out points). * When a video is loaded as a custom brush, the same options are available with the exception of the Stretch to project size option. When you load a file in PSD format, a new project is automatically created (no import footage panel is opened) and the image's layers are all present in the timeline.